Having accomplished my tenth 747-400 operator earlier in the year, I was truly not expecting to fly an eleventh any time soon. But when I got a last-minute trip to Asia, I thought it might be possible to do just that. Asia used offer a lot of 747 flights on routes throughout the region, but operators there have begun retiring their fleets, and it is no longer quite as easy to find a convenient route. 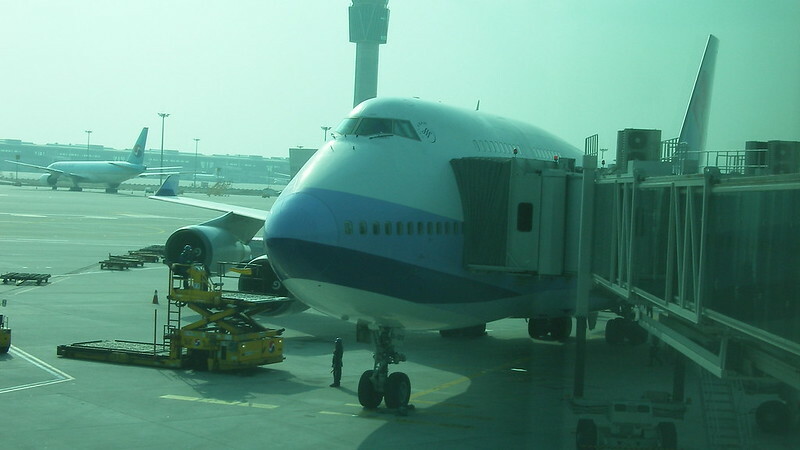 Additionally airlines there often swap equipment on regional routes, making it even harder to guarantee the 747. With that in mind, I began my search for a 747 route with low probability of an equipment swap. China Airlines received the distinction of becoming my eleventh 747-400 operator. Their morning TPE-ICN departure showed a perfect historical record of 747-400 with no equipment swaps. The flight time did not line up with my flight home out of ICN, but an overnight in Seoul would be a small price to pay to fly a new 747. Booking the flight in conjunction with other flights in my trip, as a Korean Air codeshare with a Korean Air flight number, meant I was able to get a good price, too, and I was very happy to be able to snag this last-minute additional 747 flight. My day began at TPE T1 check-in area 2. I found kiosks and bag-drop counters, plus full-service Economy check-in available. I joined the short queue for the full-service check-in. The agent advised that no window seats were available, and I was assigned seat 19D. Booking China Airlines as a codeshare meant their website was unable to assign me a seat, and I had not bothered to try to call them for an advance seat assignment. I wasn't even sure where 19D was within the plane. Security and exit immigration both had very short lines. I got my Taiwan exit stamp and headed to the China Airlines lounge. I was in the lounge by 06:05. Boarding was set for 07:10 and departure for 07:50. I was excited for a new 747 flight today with China Airlines. With 747 flying in the region now substantially reduced from a few years ago, and with regional flights commonly subject to equipment change, I was glad my luck held out and my aircraft this morning was the 747-400. I had previously flown China Airlines once before, three years ago on a regional flight on their A340-300. That flight had been notable for being my first-ever A340 flight. I was glad I had flown that aircraft back then, because in the meantime, China Airlines had retired their A340s. In the lounge I checked the seat map online to discover my seat location onboard. 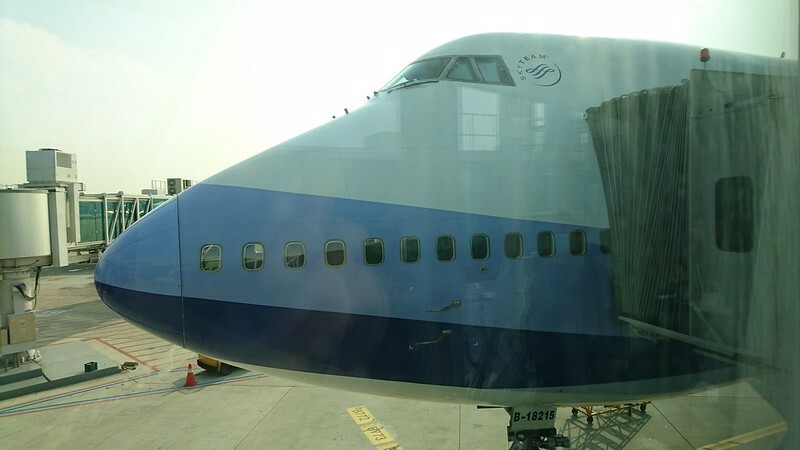 The last remaining China Airlines 747-400 configuration has 12 seats in the nose - the former First Class seats (no longer sold as First Class on this plane). I am not sure how to snag one of these flat-bed seats. 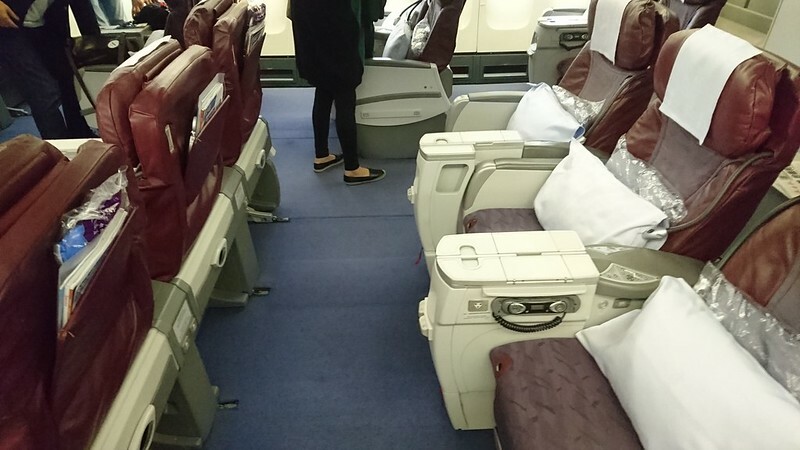 The Business Class, which features angle-flat seats, begins aft of the front doors. Between doors 1 & 2 they have 2-3-2 seating, plus a further six rows of 2-2 on the upper deck. My seat 19D was the last aisle seat in the main deck cabin. Economy takes up the rest of the lower deck in a 3-4-3 layout. There is no Premium Economy. I headed to my gate, B5, by 06:55. Unfortunately the gate offered no good view of plane, but I was able to see the registration number B-18215. B-18215 is a rather new 747-400 dating only to 2005. It is indeed quite new, as I found out later that B-18215 is the very last passenger 747-400 ever built! The crew boarded at 07:00, and then it was announced that passenger boarding was delayed due to ground operations until 07:35. Boarding began at 07:30 with Sky Priority. I boarded through L1 and made a right turn into the main deck Business Class cabin. First impressions? 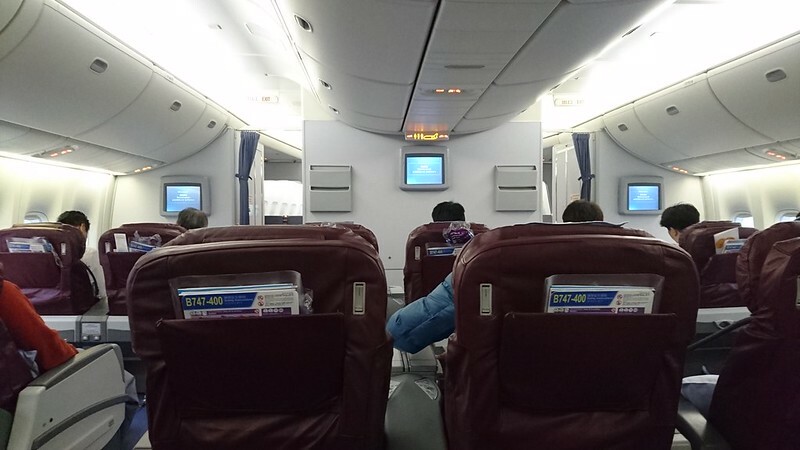 Similar to my China Airlines A340-300 flight three years ago, very old school! 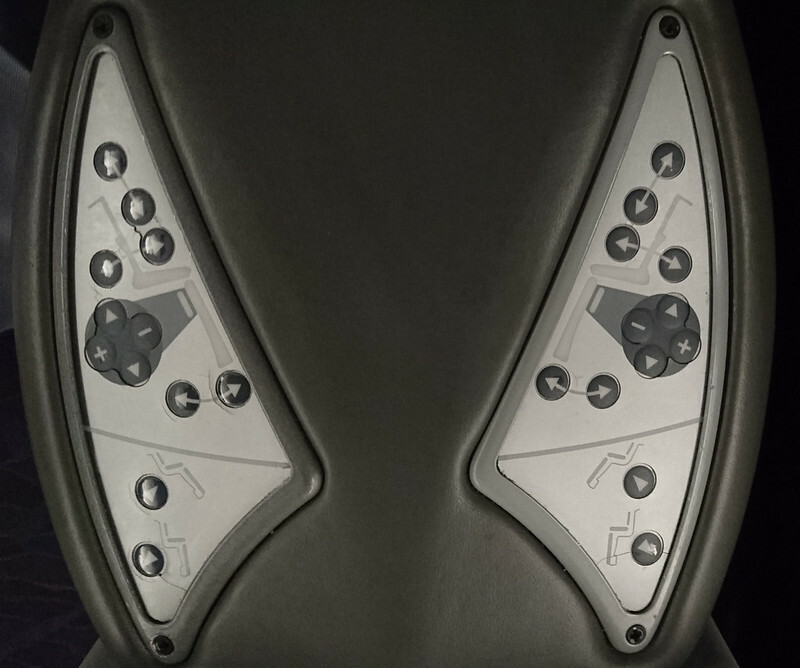 First of all, I stand corrected: these are not angle-flat seats, rather they are recliners with very good pitch. 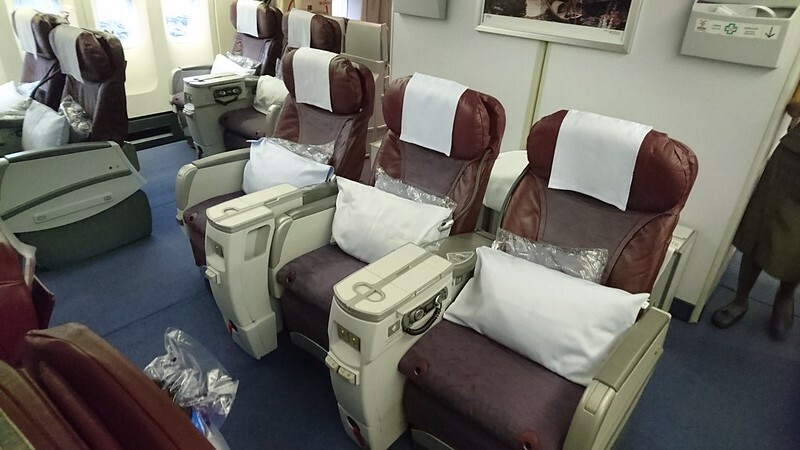 The benefits to these seats include a very open airy feeling to the cabin, not at all crowded like 2-3-2 747 business class with more modern seats, and of course the ability to fly in such an old-school seat, an experience which is not easily available anymore these days. I was now looking forward to an unexpectedly old-school flight to Seoul! The seat was stocked with a pillow and blanket, and headphones in the seatback pocket. 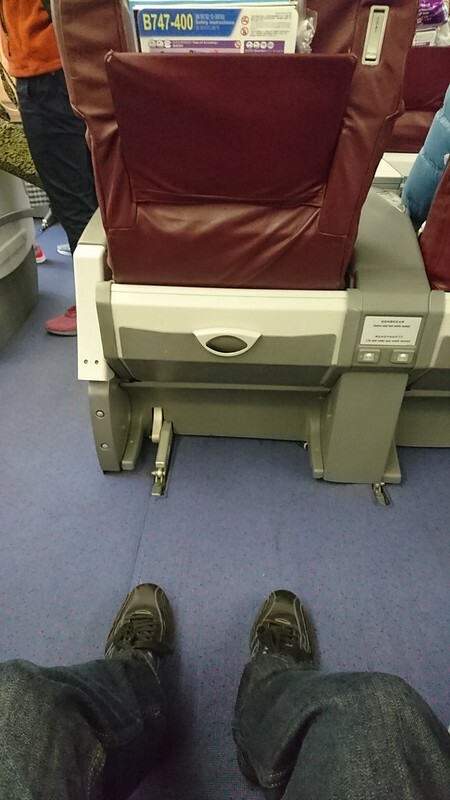 Settling in, I was already enjoying the very generous legroom, not even close to touching the seat in front. 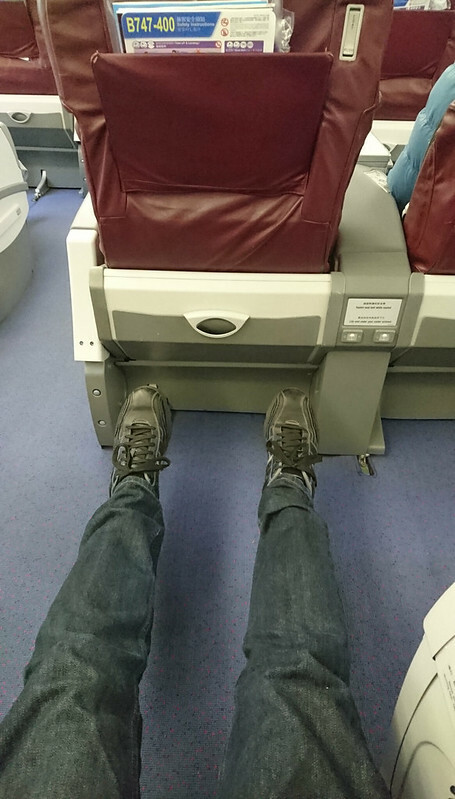 Legroom shot - can't reach! Pre-departure water, orange or apple juice, was offered. 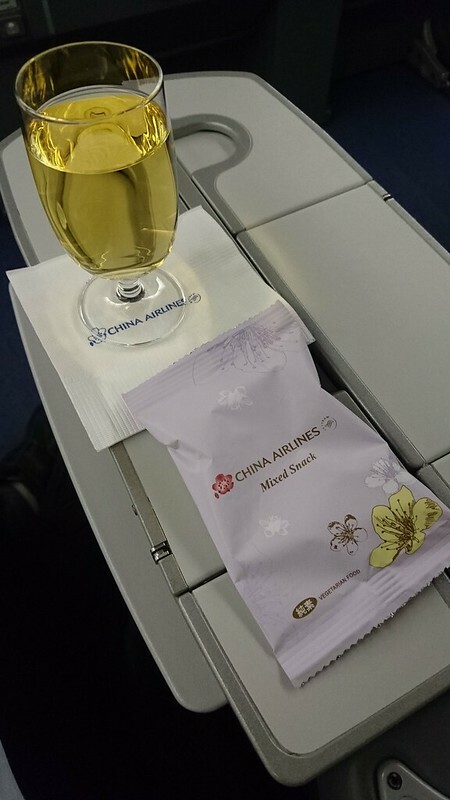 I selected apple juice, which was served with a packet of China Airlines Mixed Snack. 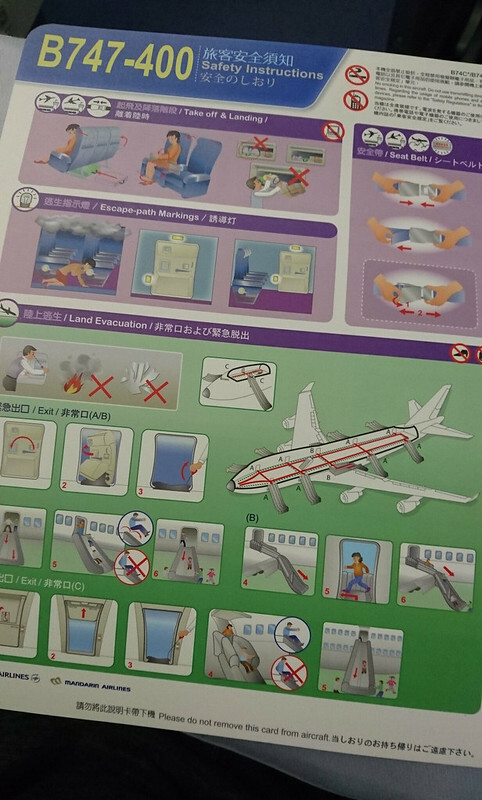 Next hot towels were brought out as boarding continued. The menu was delivered to look over, and then the flight attendant was back later for my meal order. I ordered shredded chichen with steamed rice, pak choi, and egg in five spicy marinated sauce, with fried preserved vegetables. The beer on offer was Taiwan Beer Classic, but on this 07:50 flight I ordered another apple juice. Korean immigration forms were handed out next, and then I was offered a beverage refill. I was impressed by how much they were accomplishing before the boarding doors even closed! The welcome message advised a 1h45 flight time. The load was 22/25 in this cabin, and there was no middle-seat person in my row. So much was happening pre-departure that we were suddenly pushing back at 07:55. That was pretty fast boarding for a jumbo jet. The safety video played on bulkhead screens. Each seat had a screen, but they were stowed in the armrests. After the safety video, the nosewheel cam switched onto the screens, a cool unexpected feature for this plane. We had a long taxi and were number 2 to take off, after a China Airlines 737-800. We very, very slowly turned onto 05R and come to a stop. At 08:15 thrust slowly began to increase, initially with a good four-engine sound, but then it wasn't really too loud. We slowly started off down the runway, slowly picking up speed. We ended up pretty fast and lifted off sooner than expected. The seatbelt sign was soon switched off, and flight attendants proceeded through the cabin shutting all the window shades and then the curtains to the galleys. The bulkhead screens switched to the moving map. The flight information displayed our speed increasing to 980, 990, and past 1000 km/h, making this one of my fastest flights. And we already had only 1h30 to go, with a projected arrival time of just after 11:00 Korea time (one hour ahead of Taiwan). Linen was brought out to set the tables, and meal service commenced. My meal was served with a water in addition to my juice. A warm croissant was also on the tray. The flight attendants continually walked throughout the cabin with additional water for refills, as well as a bread basket for anyone wanting a second helping. The food was pretty good; shredded chicken was not a dish I'd previously tried. Next the purser went through the cabin checking on everyone. He was wearing a cool China Airlines 747-400 tie clip, and was very happy to receive a compliment on it from me. I took a quick bathroom break. There was one on either aisle to the front of the cabin, and it was nice and clean with a dressing platform and even a frosted glass window, which changed to clear with the press of a button. I took a peek into the nose cabin, the old First Class. It was completely dark and not in use, no wonder I couldn't figure out how to get a seat assignment in that cabin. 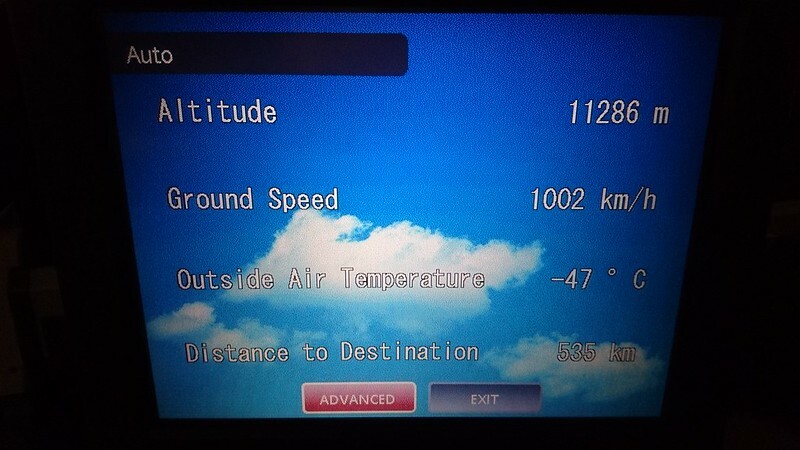 There was now only 1h left in this short flight. Over 900 miles in such a short time is pretty fast. I reclined fully and extended my leg rest to get comfortable. The seat was very roomy, but this old seat could be better, as the seatback seemed to have several seams or joints going across my back; I was probably feeling that due to the age of these seats. Nevertheless it was time to relax and enjoy the remainder of my short China Airlines 747-400 flight. The lights were switched off and the bulkhead screens were, too. I continued watching the moving map on my personal screen, and the purser continued passing through the cabin checking on everyone. The captain announced that we would begin descent shortly; the weather in Seoul was 10 degrees, and we should arrive at 11:10. Hearing this, the passenger in 19F, asleep the whole time so far, woke up, and despite the late time in flight, a flight attendant immediately appeared to offer the meal service, which was accepted. With the purser always available and now this, it was very attentive service indeed! With only 50 miles to go, the cabin lights were switched back on, and the cabin was prepared for arrival. The nose cam was back on the bulkhead screens, as individual screens were stowed. Landing was at 10:03. 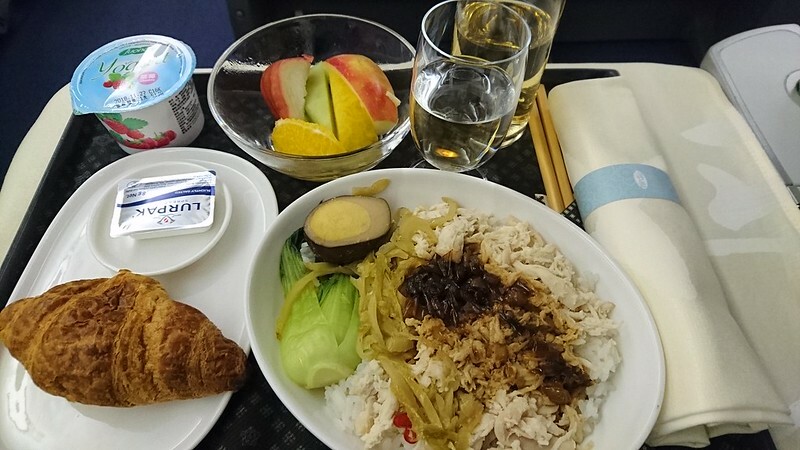 "Thank you for flying Sky Team member China Airlines, and Korean Air and Delta Air Lines code share flight!" We parked at the gate at 10:10, or 11:10 Korean time. There was zero line at immigration where I unfortunately did not get a passport stamp like last time in 2015 - now it's just a little receipt. I even made it to the baggage carousel before it started up! This was an enjoyable short trip. I am very thankful to have made it onto my latest new 747 operator, China Airlines. After Lufthansa earlier in the year, I had not been expecting any further new 747 operators, so I was very fortunate to have arranged this one during this trip. Indeed, it's only going to get harder to find another new 747 operator to fly as the airlines rapidly reduce their route options and retire their fleets. Even a 747 enthusiast such as myself is really not expecting to manage a 12th new operator. If indeed I don't manage a 12th, at least my last new 747-400 operator gave me a flight on the last new passenger 747-400. I encourage everyone to fit 747-400 flights into your trips as soon as possible, as it still remains convenient to do so, with many routes and operators currently available. It is nice you were able to add another 747-400 to your list. Yes a time is coming when they will be gone forever. Do you have any 747-400 you would like to get on next. My list includes BA, MH, SQ, LH. It seems like most of the remaining operators use their 747-400 on very limited routes with little information available online, so I'd hate to go out of the way to try to catch one, only to have a different aircraft type. Maybe Wamos Air from CUN-MAD or PUJ-MAD, but they aren't operated daily, and I'm not sure about the 747-400 retirement schedule for Wamos Air. Rossiya uses their 747-400 on PUJ-VKO, but I can't figure out how to book it without booking a vacation package deal originating in Moscow. I think I'm going to focus more on flying carriers I've already flown, but in a different class of service. I'm trying to set up British Airways World Traveller Plus next year. Congrats on the MH and SQ 747, you can't fly those anymore! 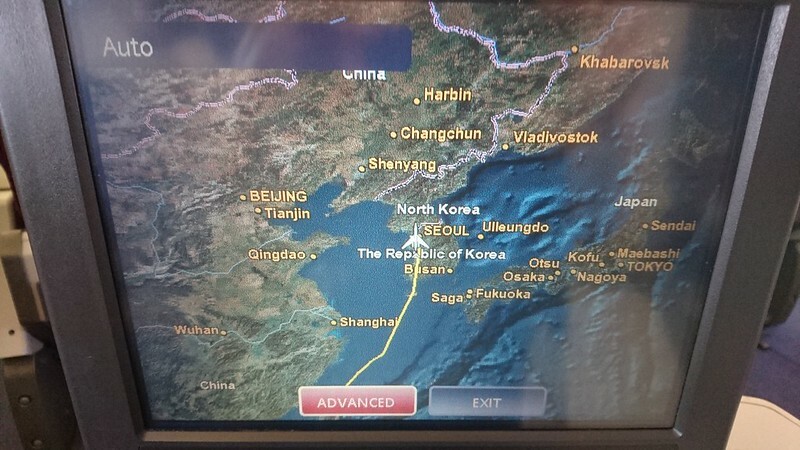 I was delighted to read your trip report as I’m considering the option of flying with China Airlines to Seoul! I have read great reviews regarding their 777 Premium Economy service from Los Angeles (my home airport) to Taipei. Thank you for sharing! It's good to know that you still have a chance to fly with the Jumbo Jet. I've only experienced Cathay Pacific and China Airlines 747. Thank you for sharing.